I am not a naturally happy mom. I have to work to be a happy mom but I do work at it. Here’s the thing. Happy moms usually mean happy households. There is a saying my mom used to say, “If momma ain’t happy, ain’t nobody happy.” Well, it’s kinda true. First, we have to get to the root of why momma isn’t happy. The truth of the matter is as moms we are more likely to yell out of frustration than anything else. We approach every situation as calmly as we can and when our requests or demands go ignored we raise our voice. Most moms want to be happy, we really do. We don’t want to yell and everytime we do we feel as though we are the worst people on the planet. This is sometimes the ultimate struggle of motherhood. You immediately feel bad because you are trying so hard to not yell at your child. However, you feel like the only time they listen is when you are yelling at them. Of course they are crying and you just feel like the worst mother on the planet. You aren’t because we all lose it and yell at our kids. The first step in the process of becoming a happier mom is forgiving yourself for not being a naturally calm or happy mom. Do not hold on to this feeling of being a bad mom. You are not a bad mom you just have bad moments. It’s natural for us to lose our cool and you are actively working to figure out a way to be better. So the first step is to forgive yourself for yelling. The next step is to turn this into a teachable moment with your child. Sit down with them and explain what frustration, anger, and fear is and how all three can cause mommy to yell. Explain the differences in the emotions and explain which one you were feeling when you yelled. Make sure you explain to your child that you are upset with their actions but you love them. Side note: Be prepared that one day your child will probably look at you and explain that they are upset with your actions about not giving them extra screen time or stay up late but they still love you. From here you can start the process of working on how you handle a situation. Figure out how your child would best respond to your requests without the damaging effects of yelling. It might be a grounding or a time out. The thing to understand is that your child will need time to learn what is acceptable and what isn’t. Remember, your child still has a developing brain and trillions of neurological connections being made. With that much going on in your child’s brain it is only natural that the process of learning better actions might take a few failed attempts first. If you feel like yelling, stop and wait 10 seconds. In this those 10 seconds ask yourself if yelling will be harmful or helpful to the situation. There is one exception to this rule: IF your child is in immediate and actual danger you are absolutely to yell first and deal with it later. Remember what actual danger means, running out the front door, picking up a knife accidentally left on the kitchen counter, playing dangerously on stairs, ect. There are a few things that you can do to help yourself be a happy mom. While most of these things fall under self care there are a few things that will take extra practice. Are you getting enough sleep? As I’m sure you know a lack of sleep can affect your moods. If you are feeling exhausted it might be time to consider telling your husband to handle the kids for the night and go to bed earlier. You could also try napping when they nap, if they are older and capable turn on a movie and take a nap. Switch with your husband on weekends with who wakes up with the kids and who sleeps in. If you toss and turn at night or your sleep is broken try getting a weighted blanket like this one. I honestly don’t know how I went so long without it. The company also has kids sizes and weights so you can try getting your kid to rest more easily with their own weighted blanket too. Are you eating enough? Oftentimes we get so busy taking care of so many different things that we forget about our own basic needs. Make sure you eat a large, healthy, and filling breakfast every morning. Being a mom requires loads of energy and the best way to keep those energy levels up is by making sure you are eating right. Food is energy for you to get through your day with, if you don’t fuel your body you will continuously run on empty. Running on empty will make your emotions go haywire. Fuel your body to keep your moods steady. Are you getting enough quiet time? In our society we are always around noise. TV, phones, music, or talking, the noise just doesn’t stop. The visual noise can be just as bad. Make sure you are getting a sufficient amount of quiet time. Be it sitting in your car in silence for a few minutes or quiet time at night before bed. Even if you need these earplugs to get quiet time, go for it. Quiet time helps you to slow down, calm yourself, and to give yourself a moment to decompress. This will help you to start from a place of calm instead of having your brain compete with the noise in your life. We all know that time outs can be an effective form of punishment for children. Well what if it’s not the child who needs the time out – but the mommy. Mommy time outs are basically for those moments when your kids aren’t necessarily being bad but they are just annoying you. You call a mommy time out and go to your room where you sit for 5-10 minutes so you can calm down. I started mommy time outs for me because they helped me to take a step back to find out exactly what my issue really is. These time outs are great for everything from needing a break from your stress to de-escalating an argument. Keep these in your back pocket and use as necessary to remain calm in stressful situations. One of the best ways to become a calmer mom is to ask for help or back up. Grab someone who will listen and come up with an action plan. If you feel like you are the only one fighting your kids bad behavior ask your husband to back you up with the kids. Or if you just need some time away ask a friend or grandparent to sit with the kids while you get away for an hour or two. Are you taking time to meditate? Meditation can be a powerful way to stay calm and be a happy mom throughout the day. It doesn’t matter if you get just a couple of minutes to meditate or a full 20-30 minutes. Just taking a few minutes each day to sit and focus only on your breathing will help you to clear your head and feel calmer. Are you getting enough exercise? No, running after your toddler does not count as exercise, I checked. Lucky for you it could just be 30 minutes of dancing in your living room with said toddler. Doing this a few times a week is not only fun for your kids but helps you to get healthy, release happy hormones, and add some fun to your day. This small little task can go a long way to making you a calmer and happy mom. I am a card carrying member of Control Freaks United but I gotta tell you, being a control freak can destroy your mood. It takes a lot of self control, especially in the beginning, but you need to learn to just go with the flow. Running late, messes, highly spirited kids, and life in general is uncontrollable at times. If things are already not going as planned sometimes it’s best to just stop take a breather and vow to roll with it. I deal with my lack of control over a situation by cracking jokes. If I’m laughing and making others laugh it really helps to ease my tension and the possible tension I could cause on others. Learn to let go a bit because life is messy and honestly, it’s beautiful that way. There are two types of memories that you have – good or bad. Do you want your kids remembering a mom who was freaking out all the time or one that was calm and happy? As a kid I loved baked beans and hot dogs for dinner. My mom made this because at one point we were broke or she was too exhausted from work to make anything else. As a child I never knew my mom made this for those reasons, I believed she made it because we liked it. I didn’t find out to some years later that it was a broke and too exhausted to cook dish. I just remember the dinners where we sat as a family at our kitchen table and enjoyed hot dogs, baked beans, and conversation. Your attitude when you spend time with your kids will determine how they view you. So make sure you are taking time to have fun with your kids. Be it around the dinner table or sitting on the living room floor playing. These activities can shape the way you are viewed in your child’s eyes. Sometimes the only adult interaction you are getting is when you are spending time with your husband. Make sure you get this time in. Schedule date nights, have nightly conversations, steal away moments to just be close to each other. This time together is important to nurture and continue to grow as a couple. It’s also necessary for the mental wellbeing of both of you. You aren’t going to become a happy mom overnight. It will take practice and time to adapt to new ways to react to stressful situations. Be kind to yourself during this transition. Make sure you are keeping up with your self care, start keeping a journal, and unless it’s an emergency – stop and think about which reaction will get the results you want. 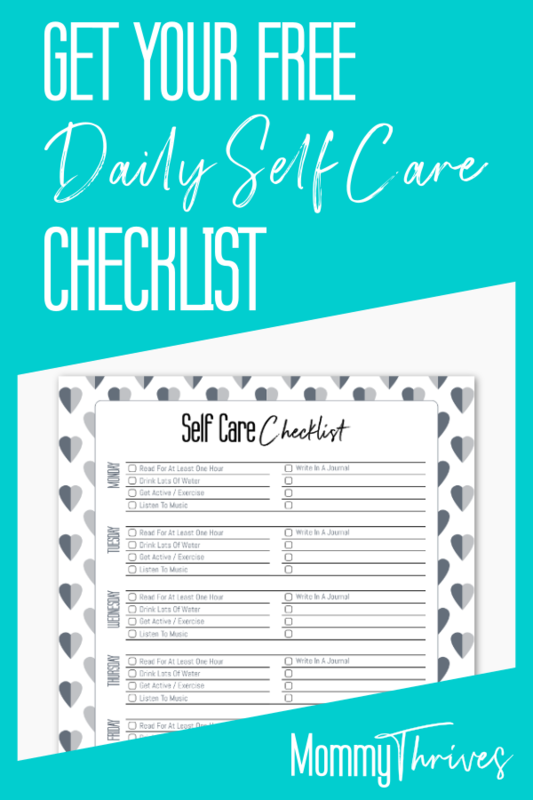 Sign up here to receive a copy of my Daily Self Care Habit Tracker to help you become a happy mom. Let me know in the comments what you are doing or plan on doing to become a happy mom. Follow me on Pinterest for more like this and pin this to your motherhood boards.